Recover corrupt and damaged PST files and create a new healthy PST file. Installation of Microsoft Outlook is not required to run the software. It Recover all corrupted items of PST files like emails, contacts, tasks, notes, calendars, journals, to-do-list etc without any data deletion. Basically the corruption occurs due to a virus attack, firewall, add in, smtp wrong setting, hardware and software malfunctioning etc. If the emails of Outlook has been deleted or password protected (by safety point of view) then download Outlook Recovery software. Because the software helps to load, scan, and recover even the password protected PST files reliably. With this Outlook Repair application you can recover your PST files and restore specific database into various file format such as MSG, EML and PST as per your requirement. Once Recovery get completed it allows saving PST file at desired location on your system. Outlook PST Recovery software allows user to select particular duration PST items, so that they don't have to wait for the whole database recovery. 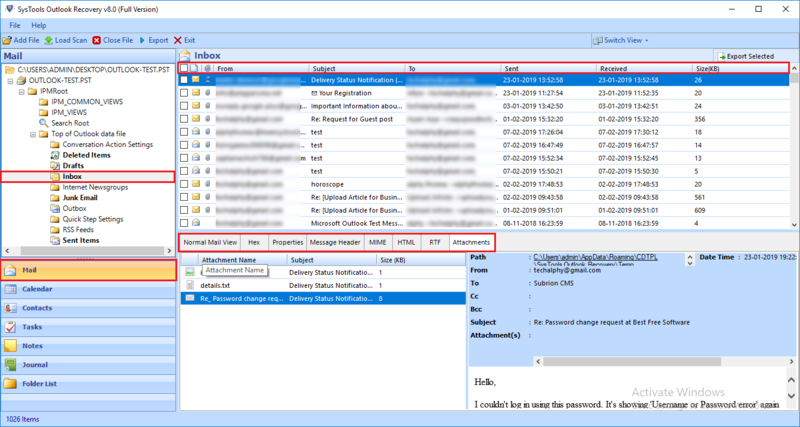 It shows the preview of Outlook PST item with attachments before as well as after the recovery process. This option helps you in managing database in a better and effective way after recovery. It provides multiple options to arrange your data according to date, form and subject. 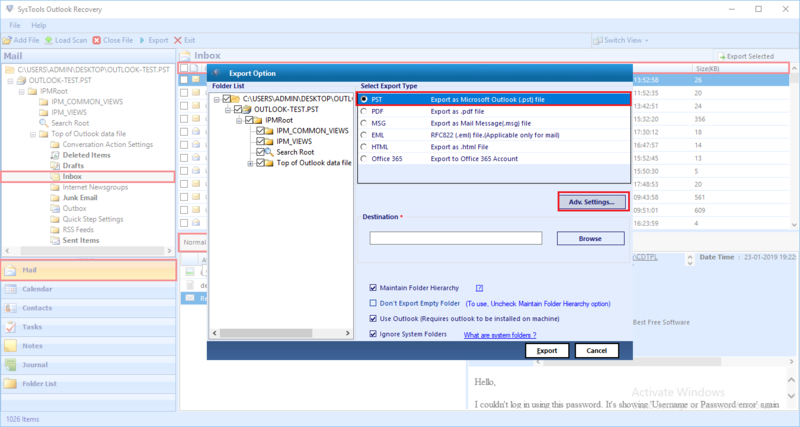 So that you do not get any difficulty in searching your data of MS Outlook. 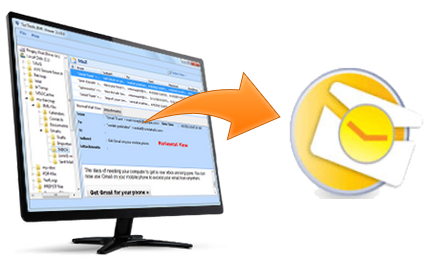 The Outlook PST Recovery software provides two different types of view in order to view the panel of the software. The views are "Horizontal View" and "Vertical View'. To change the view of the panel, click "Switch View" button to switch from current view to another view as per your convenience. Outlook Recovery Software is workable with all editions of Windows and MS Outlook from 2016 to 2000. Both technical and non technical person can simple work with this software as it is integrated with an advance user interface. "When I have seen that Outlook emails of my Outlook 2013 are not accessible, I was really worried about the email recovery. But it was my good luck that someone suggested me to use Outlook PST Recovery tool for email data revival. This application is applicable to perform PST data repair for all version of Outlook so, I have used it with my Outlook 2013 and got expected results." The tool that supports the platforms as: Windows 8/7/Vista/2003/XP/2000/NT4 (SP6), MS Outlook 2016, 2013, 2010, 2007, 2003, 2002 (XP), and 2000 is available for free download also. Free version of the software recover particular number of items per folders. Demo provides you a real impact about the functionality of Outlook PST Recovery Software. So try free demo first and then move towards investing on the activated version of software. 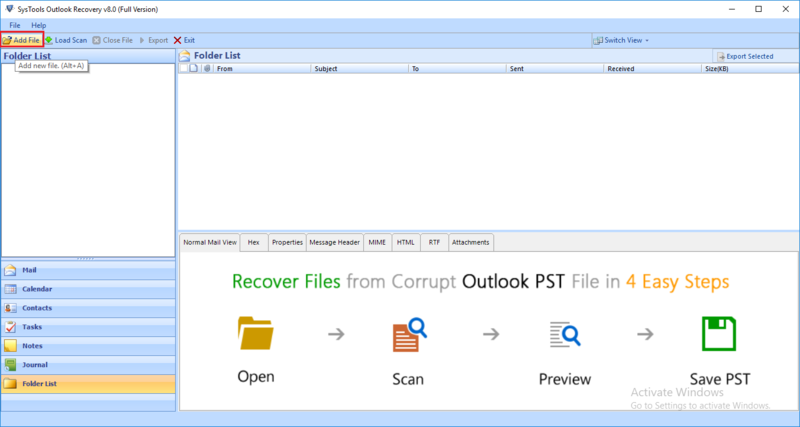 You can repair or recover multiple PST files with the help of full version of Outlook PST Recovery tool, as this tool easily & quickly remove Outlook error issues and repair corrupted PST files. License version break the boundary of limited recovery and provides you the authentication of recovering, restoring and splitting multiple files of MS Outlook.